When my brother and I were younger, we were "really into" the Civil War and the Second World War. My mother indulged us in our interests, and the bookshelves in our house overflowed with several Time/Life series for both periods. Today, the volumes of the World War II series inhabit my own shelves, many volumes' spines hopelessly compromised from the hours we would spend pouring over them. It was in one of those volumes that I first learned of Finland's valiant but hopeless defense against a Soviet invasion in that period between Sept. 1939 and the Nazi invasion of Russia in 1941 when the fascists and the communists were "best friends forever." Robert Edwards is not a historian (he's a journalist) but that doesn't detract from the quality of his writing. He does, however, assume the reader's familiarity with the larger picture of events in the first two years of the war so I couldn't, in good faith, recommend this to anyone other than fairly serious students of WW2. But recommend it I shall since it's a good recounting of the Finns' remarkable resistance to the Soviets, the utter incompetence of the Red Army post Stalin's purges, and the unsurprising pusillanimity of every government in the conflict - Allies, neutrals & Axis (though, to be fair, considering that these men were contemplating war, it's understandable that there was hesitation and vacillation that, in hindsight, may appear more cowardly than warranted). 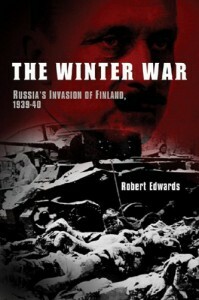 The author makes no wild, revisionist claims about Finland's or the Winter War's role in WW2 - it was a sideshow (except of course to the Finns & Russians slaughtered) but it did cause a shake up in the Red Army command that may have given it the edge to survive the disaster of the first few months of Barbarossa, and it convinced the German High Command that Russia could be conquered by a well led, modern armored force, which the Wehrmacht certainly was.